SWEDISH goalkeeper Viktor Noring has joined Hearts on a two-year contract. The 25-year-old agreed terms and will now provide competition for Hearts’ first-choice goalkeeper, Jack Hamilton. 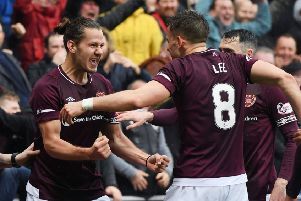 Tynecastle officials succeeded in having Noring registered with UEFA before the Europa League second qualifying round registration deadline, which is midnight tonight. Noring was offered a deal earlier this week after impressing on trial. He returned home to Sweden to think it over before deciding to commit his future to the Edinburgh club. “It feels amazing to have signed here. It’s a good opportunity for me to come here and try to get the number one spot, so I’m very happy,” he told the Hearts website. “I’ve been on trial here for a bit and I like the style of football the team is trying to play, it’s similar to what I’m used to.